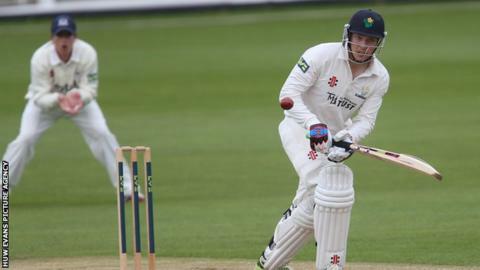 Glamorgan's Gareth Rees admits he has not been enjoying his cricket after announcing his retirement from the first-class game. The batsman scored almost 8,000 runs in more than 100 games for the county. But Rees, 29, played in only seven County Championship matches this season which influenced his decision. "I've always enjoyed playing for Glamorgan but there were probably times I didn't enjoy it as much as I may have done in previous years," he said. "Obviously when you spend time out of the first team it's difficult. "Spending time out of the first team obviously contributes to looking outside the game and what your option may be. "I can look back on my career and be proud of what I've done with Glamorgan and made some lifelong friends." Rees made his first-class debut for Glamorgan against Gloucestershire at Cheltenham in July 2006. His highest score was a knock of 154 against Surrey at The Oval in 2009. "It's with a heavy heart you leave the club that you've grown up wanting to play for," Rees added. "But things move on and everybody's career comes to an end at some point and now's the right time I believe for me. "It's obviously a big decision that I've made but it's one that I'm very happy with and now I look forward to the future. "This isn't an easy decision you take lightly. It's taken quite a bit of thinking time over the last few weeks. "I've got a young family, a new-born baby boy, so it's taking all these things into consideration and what my life will be moving forward." Rees will now resume his studies at the University of Bath, from where he graduated with first-class honours in maths and physics. Swansea-born Rees has not ruled out playing club cricket as he looks to start a new career in business. "I believe that's opened up some exciting opportunities for me in the future," Rees said. "I'll be finishing my university course and I look forward to what happens from thereon after."